Low risk/ High reward gimping options. Use needles as a projectile to force opponents to approach. Needles charge relatively fast, and can be canceled into shield and dodge to make them a relatively low risk option on opponents try to punish while you’re charging. A much more dangerous option is the new grenade attack [Side + B] Sheik received. This move has lots of recovery so use this SPARINGLY while the opponent is on the stage. Sheik’s new bouncing fish attack also allows her to attack from a far distance. Even if opponents shield the attack, she bounces back a relatively far distance. Here Sheik has very limited options. 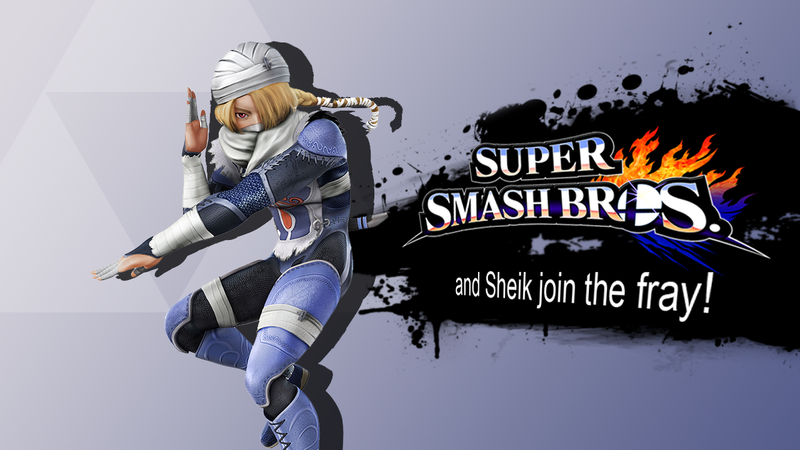 Go into training mode, and test out the length of many of Sheik’s A-attacks. You’ll notice that they all stop at just about the same range. This is the range where you are weakest. Any character who can take advantage of this range will give you a problem. For that reason, try to keep opponents out of the area on screen. You can’t reach them with regular attacks and needles are too risky at this range to use. Great pressure and mix-ups because of her fast normals. Sheik has great comboability starting at around the 20% range. She also gets decent combos from her forward throw and her down throw. Sheik is her strongest while she is on offense while the opponent is at this range. Sheik has lots of great options here with relatively little risk involved. You can hit opponents with sweet-spot back-air [Around the start-up of the attack] and neutral-air. These moves have good hitboxes and are very fast. Sheik’s new grenade attack is AMAZING. When an opponent is trying to recover while you are on stage, you can throw this over the edge from afar to try and hit them with the explosion while they are returning to the stage. Bouncing fish is also very useful to stop recoveries. Bouncing fish can be used from on-stage [if the opponent is recovering from high above], b-reveresed while holding the ledge [To do a b-reversed move, press down + b while holding onto the ledge, and then quickly hold the control stick away from the level. You will attack in the opposite direction], or while clinging to the wall [Sheik is one of the few characters who can cling to a wall while her back is to it] and the opponent is trying to recover [from low under the stage]. Sheik has always had her teleport up + B attack which now has hitboxes on the start-up and just before the recovery when she reappears. With the addition of bouncing fish, Sheik also has an extra horizontal recovery option in this attack. In the beginning play at a distance. One you can rack up around 20% or so with needles, you can move in close to more effectively combo the opponent into a favorable situation using forward-air attacks and forward-tilt attacks on the ground. At this stage focusing on gimping, the opponent in order to take a stock. Using moves like Sheik’s bouncing fish, grenade attack, up-air, and forward-air attacks. Sheik has a hard time killing from smash attacks, so if you are going that route, prepare for the long haul, because it will be a long time before you can kill. Sheik has a boost grab [Do dash attack, and within the first few frames, press grab. You will get the momentum from the dash attack added to the length of your grab], a great pivot grab [run past the opponent hold the opposite direction to face them right when you run past them, and grab], and also a good pivot f-tilt [same as pivot grab, but do forward tilt instead of grab] to read opponents actions. From low percents [< 20%], only jab attacks will combo, so be wary of this. At mid percentage ranges [40% ~ 20%] you can combo with multiple forward-tilts, forward airs, and bouncing fish. Also throws can be comboed into forward-air, up-air [Up air has better killing power], as well as bouncing fish. I hope you found the following information useful and a good starting place to develop your own Sheik gameplan. She’s a great character in the new smash, and I’m sure you’ll have a ton of fun with her! If you have any questions or comments hit me up below or on my ask.fm page on the right. I’ll be happy to speak with you!